It's already been hot for several months and you're getting tired of movies and bowling—and how expensive those activities can be. The great thing about the free concert series at the Chandler Center for the Arts is that you can make it a family activity. Concerts take place in the evening, in air-conditioned comfort. You'll hear bands and musicians performing various genres of music. There will be pop, rock, jazz and more. 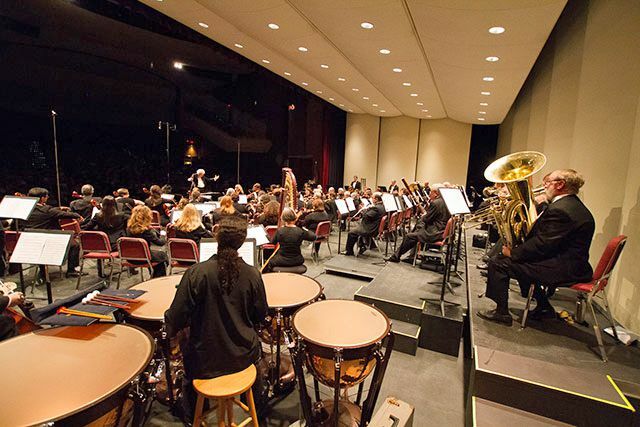 The Chandler Symphony Orchestra presents several free concerts throughout the year. These classical or chamber music concerts are also suitable for all ages and are generally presented earlier in the day. Where: Chandler Center for the Arts is in downtown Chandler. Here is a map with directions. Tickets: No tickets are required. All seating is first come, first served. Foyer doors open about one hour prior to performance. Tip: people will line up early to get in! How much: General admission is free. Donations are accepted. How much should you donate (if you can)? $5 per child, $10 per adult, $15 per family is suggested. How long: Performances last about an hour. More Information: To find out more about each specific program and the musicians performing, visit Chandler Center for the Arts online or call 480-782-2680. The Chandler Symphony Orchestra also presents a Chamber Music Series each year. Saturday, February 24, 2018 at 2 p.m.
Saturday, April 14, 2018 at 2 p.m.
Where: Chandler Community Center, 125 E. Commonwealth Ave. in Downtown Chandler. Tickets: No tickets are required. All seating is first come, first served. Doors open about one hour prior to performance. Tip: people will line up early to get in! How much: General admission is free. Donations are accepted. How much should you donate (if you can)? $5 per child, $10 per adult, $15 per family is suggested. More Information: Visit Chandler Symphony Orchestra online or call 480-899-3447. Let The Howling Begin! It's the Arizona Coyotes!